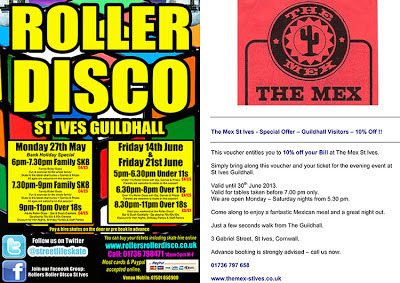 Tonight - at St Ives Guildhall - Rollers Roller Disco and Fore Street Methodist Church are hosting an Open Roller Disco from 5.00 pm to 7.00 pm. Tickets are £5.00 per person. 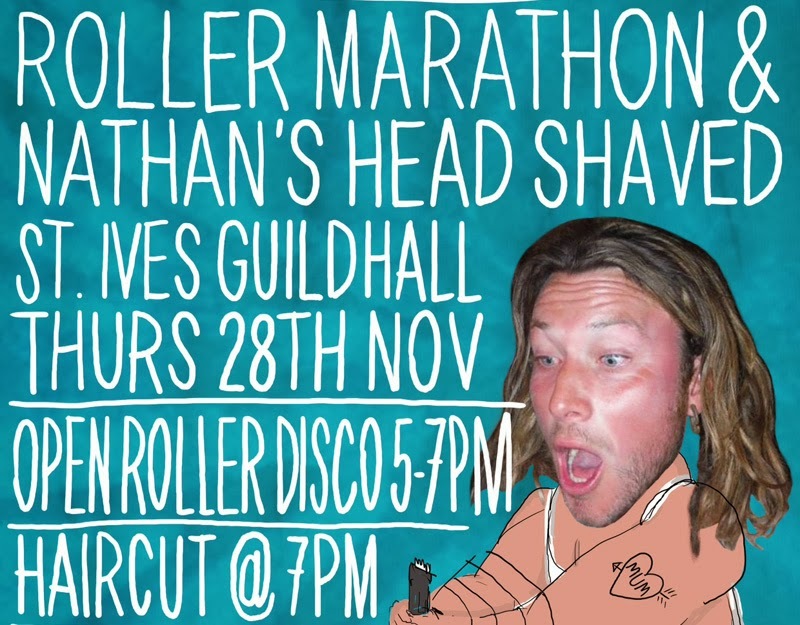 Then at 7.00 pm Nathan Thomas is getting his head shaved ...all for the purpose of sending funds for aid to the outer islands in the Philippines. 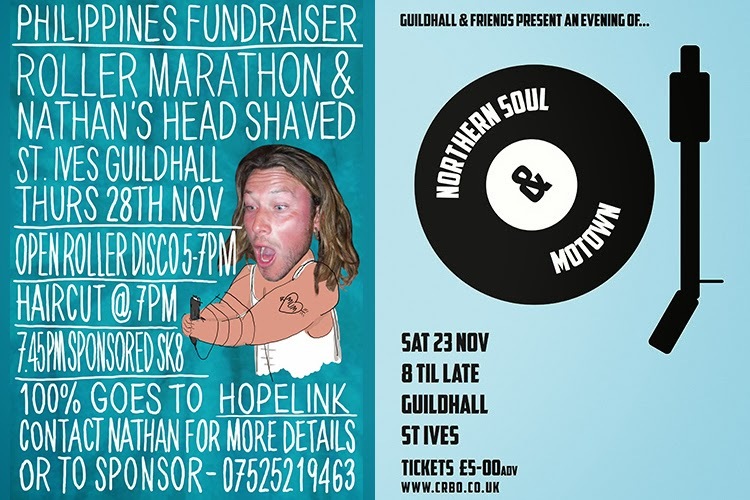 The organisers want to raise at least £2000 for Nathan's hair. If you can't make it to The Guildhall you can donate in collection buckets at Keebunga (Wharf), St. Eia Cabin (Harbour Front) and Streetlife Skates (Ayr). From 7:45pm those getting sponsored can take part in a Roller Marathon - pledging to skate 15km or 30km. If you want to take part and want a sponsor form please contact Nathan on 07525 219 463. There will be home made cakes and refreshments as well as good tunes and good times - so spread the word and get down there to skate. Or at least come for 7.00 pm to see one painful hair cut! 100% of the money raised going to Hopelink - Charity Reg. No. 1141534.
more to follow but this is the news so far. Tuesday 16th September - St Ives Theatre - Steve Knightley. A great opportunity to see his solo show in an intimate setting. For ticket info - call St Ives Theatre Box Office - 01736 797 007. Friday 26th September - St Ives Guildhall - The South. Former members of The Beautiful South return - after 20 years, 10 studio albums, 34 chart singles, 15 million record sales worldwide and performing in front of millions of fans. 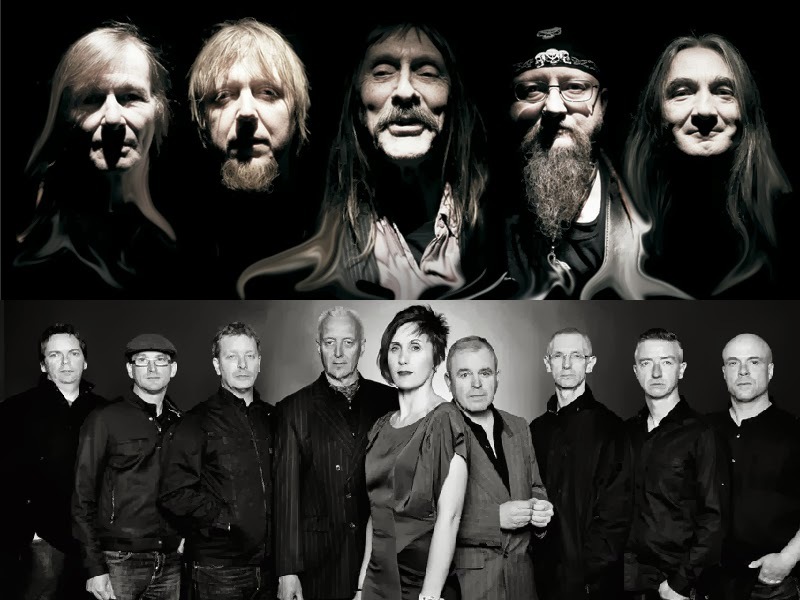 Saturday 27th September - St Ives Guildhall - Hawkwind. With the legendary Lord of space rock Dave Brock at the helm, ex Gong synthesiser player Tim Blake on keyboards and theramin , Mr Dibs on bass , long serving drummer Richard Chadwick and Niall Hone on guitar - Hawkwind bring their unmissable , spectacular show , featuring dancers , stiltwalkers , psychedelic lighting and projections to St Ives. A fantastic festival closing party. 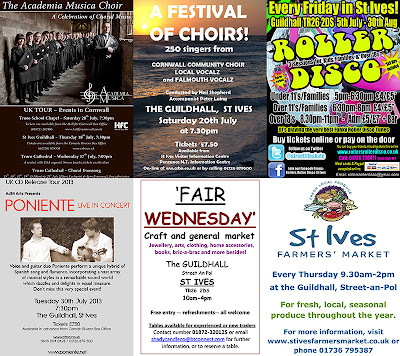 A big weekend ahead at St Ives Guildhall. 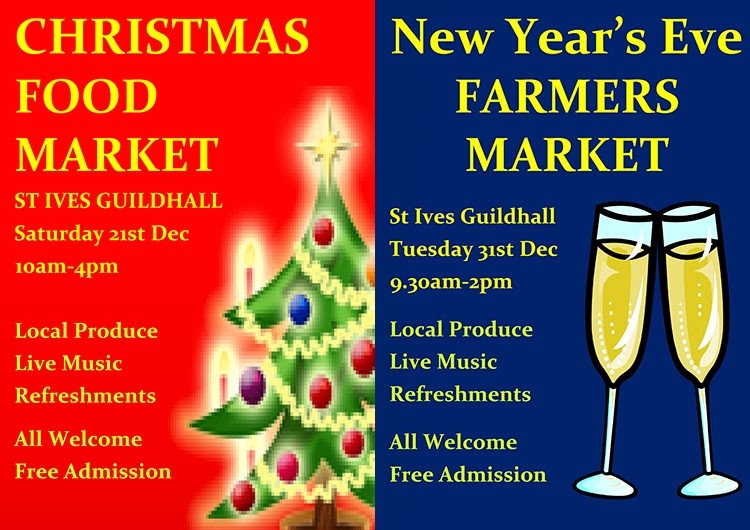 On Friday (22nd November 2013) a chance to do some early Christmas shopping at the St Ives WI Christmas Bazaar. Doors open at 11.00 am. 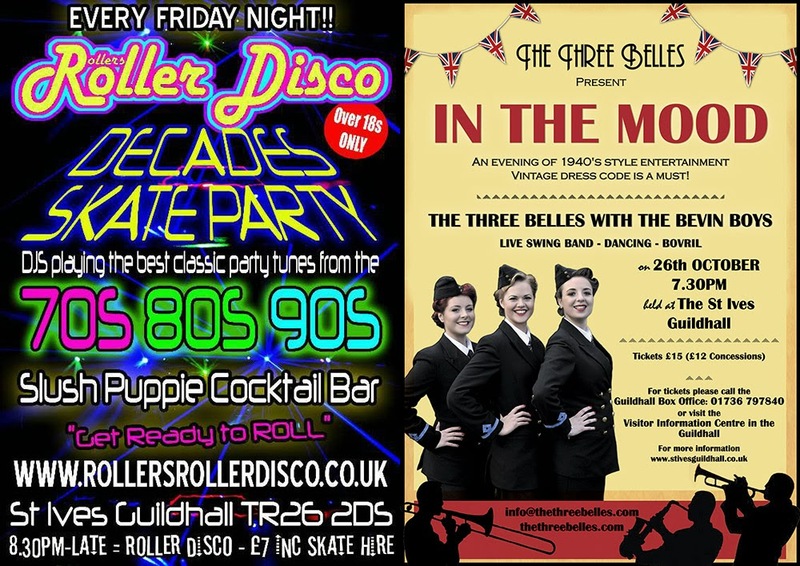 On Friday evening the regular Rollers Roller Disco - three sessions - 5.00 pm Families and Kids - 6.30 pm Teen Skate -8.30 pm Over 18s Roller Disco Party. 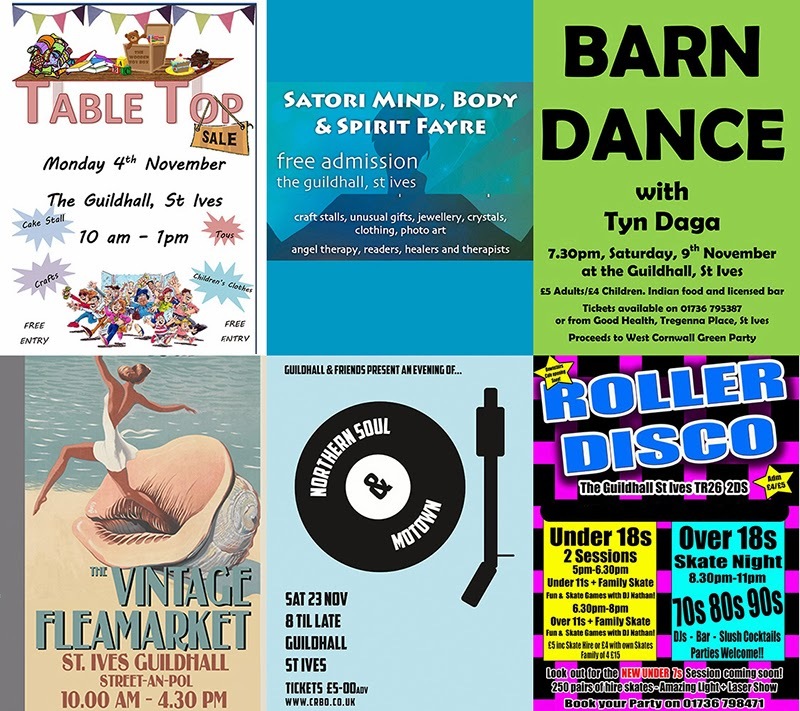 Looking ahead - a special Roller Disco Marathon has been scheduled for Thursday (28th November) - a fundraiser for disaster relief in The Philippines. Doors open from 5.00 pm. 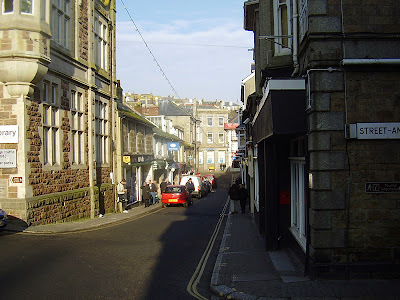 St Ives Poetry Circle meet on the first Friday of each month at St Ives Library at 1.30 pm. This session is best described as ' Poetry for Pleasure '. You are invited to bring your own poems or those that you like written by others, and read them for everyone to enjoy. If you prefer just to listen that's fine too. 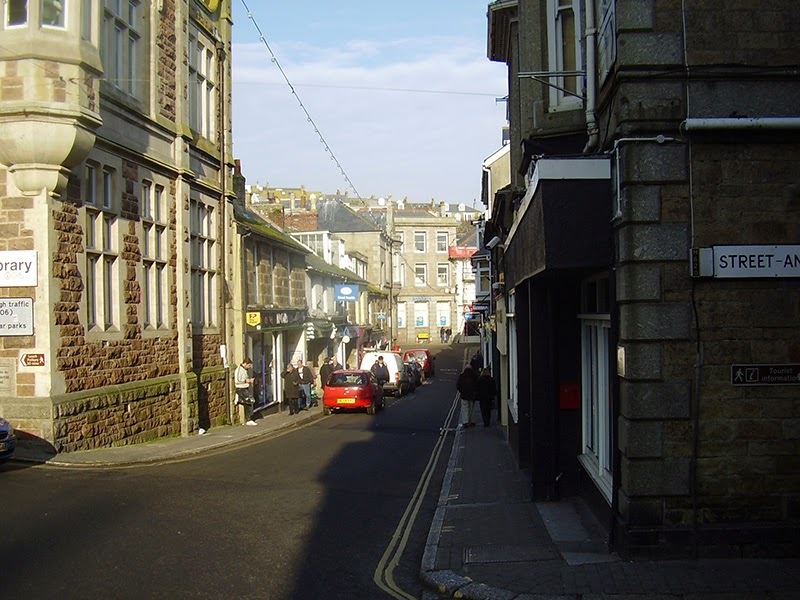 St Ives Poetry Forum meet on the third Monday of each month at St Ives Library at 1.30 pm. The first part of the session writers are welcome to bring a poem they have written, perhaps not too long, with 6 copies to hand out (there is a photocopying facility in the Library). 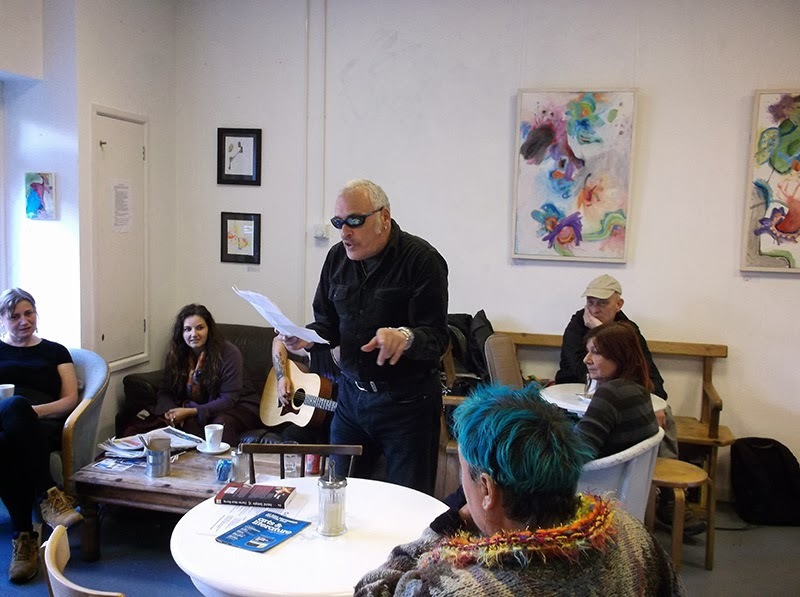 After due consideration the poem will be discussed, any questions answered and if necessary suggestions made in a friendly and helpful atmosphere. The second part needs pen and paper for short exercises to inspire future poems with a theme set by a member of the group. Scully Racing has become a new spectator sport for St Ives and the next race is on Saturday (16th November 2013). Specators are advised to gather on the foreshore opposite the Sloop Inn. New participants are also welcome. The event begins at 2.00 pm with a training session. 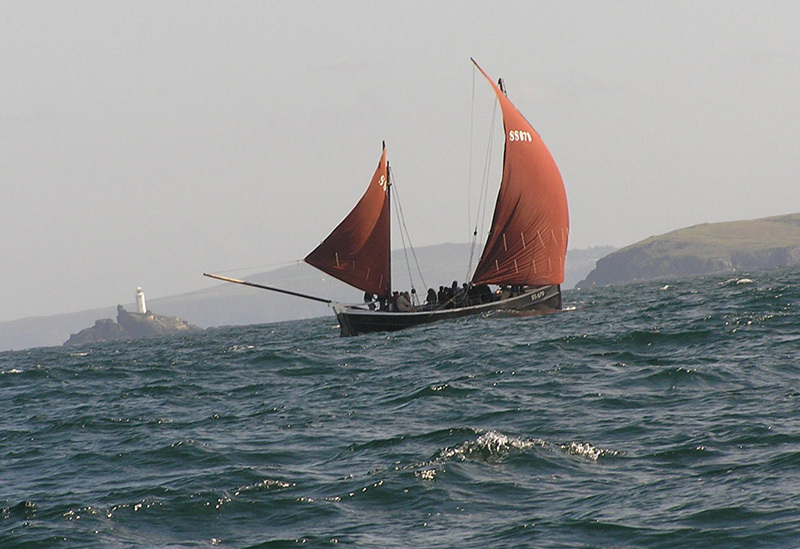 Additional punts and expert tuition will be available for the benefit of novice sculliers. The St.Ives Boatmen, the reigning champions, will be defending their title against a challenge from Newquay from 3.00 pm. Teas for the participants will be provided at the Rose Lodge. 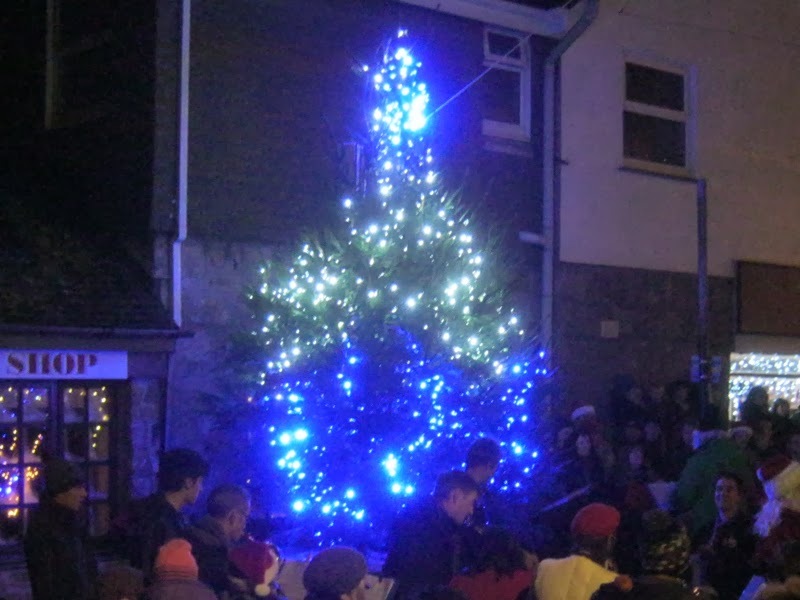 Prizes, donated by Marco Amura of St Ives Brewery, will be presented by the Mayor at about 6.30 pm in the Castle Inn - where you can enjoy a range of fine Cornish real ales and a warm welcome. More Scully Races are planned for next year as this becomes a regular event in the St Ives sporting and social calendar. 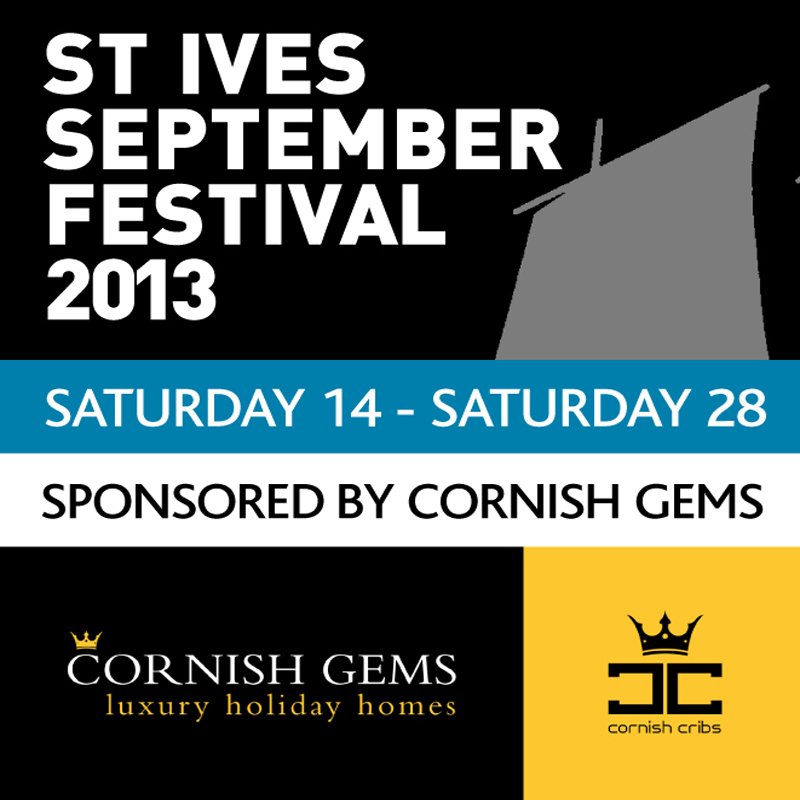 Dates have been confirmed for St Ives September Festival 2014. The festival will open on Saturday 13th September and run through to Saturday 27th. Planning for next year is underway - with some acts already pencilled in for St Ives Guildhall. More news about gigs and tickets will be posted here when confirmed. You can subscribe to this blog by email - use the box in the right hand column. Porthminster Beach St Ives - 5th November 2013. 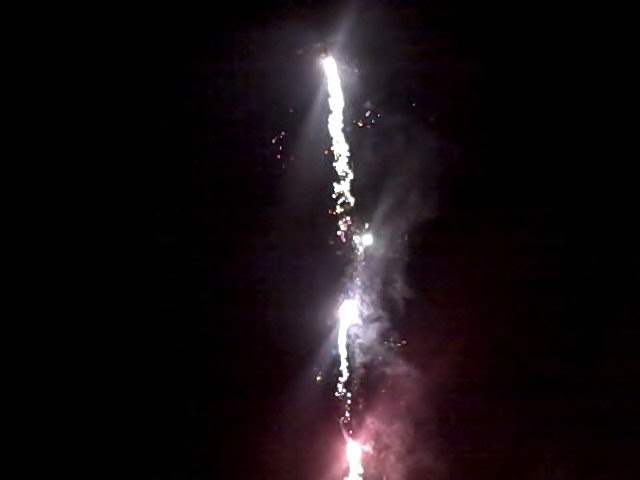 Firework display - organised by St Ives Football Club. 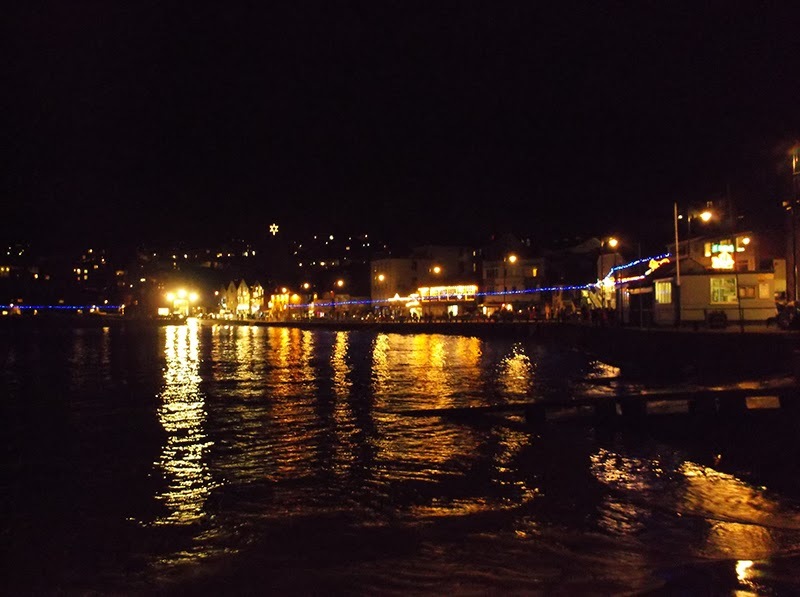 As the half term holidays come to an end St Ives gets quieter for a few weeks - but as ever - still lots going on. Bonfire Night is celebrated with two firework displays - subject to the weather. Carbis Bay Beach - Monday (4th November 2013) at 5.30 pm. 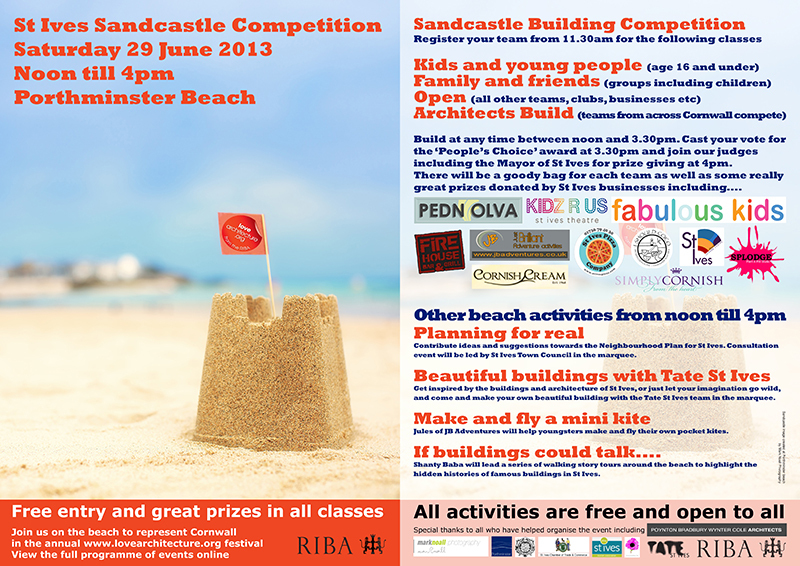 Porthminster Beach - Tuesday (5th) at 7.00 pm. Drinks and food available at both events. 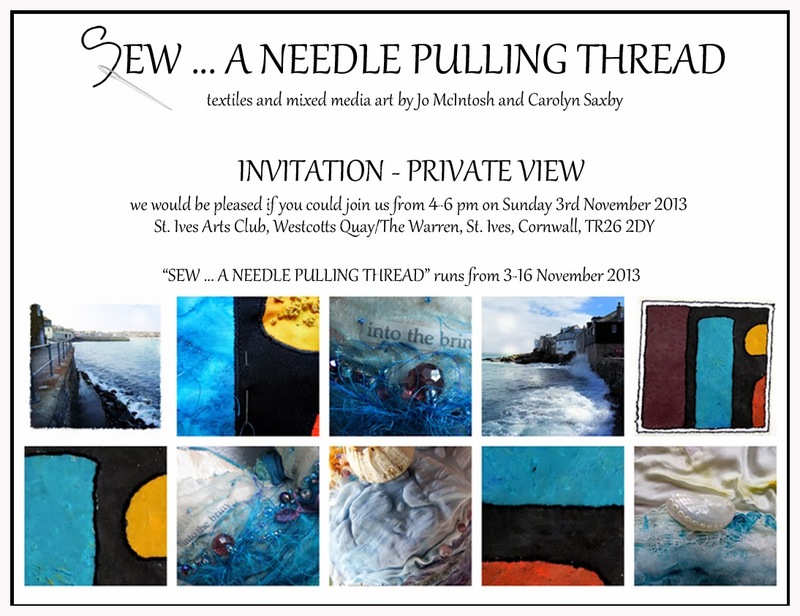 St Ives Arts Club has a new exhibition - Textile Art and Mixed Media - Sew ... A Needle Pulling Thread. Open daily - 10.30 am to 4.30 pm - until Saturday 16th November. 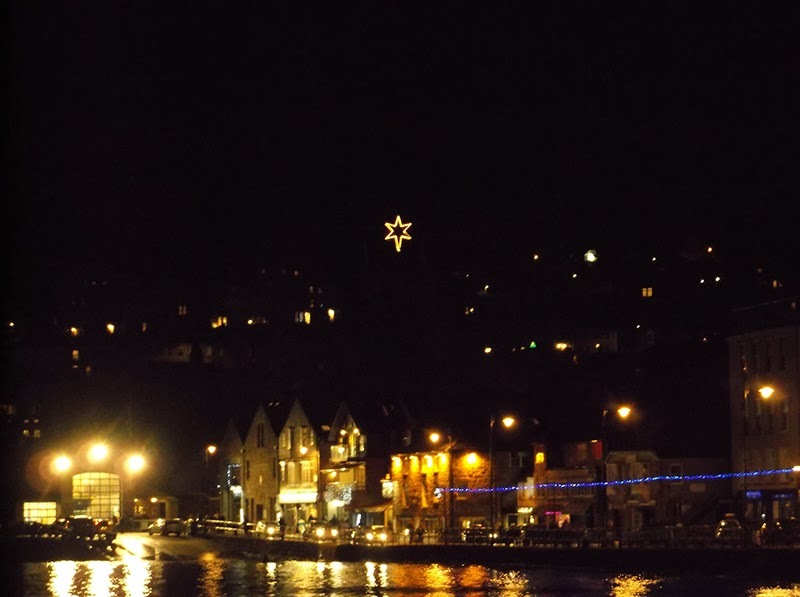 Guided Tours Of St Ives continue through the winter on Wednesdays - meet outside The Guildhall at 11.00 am. 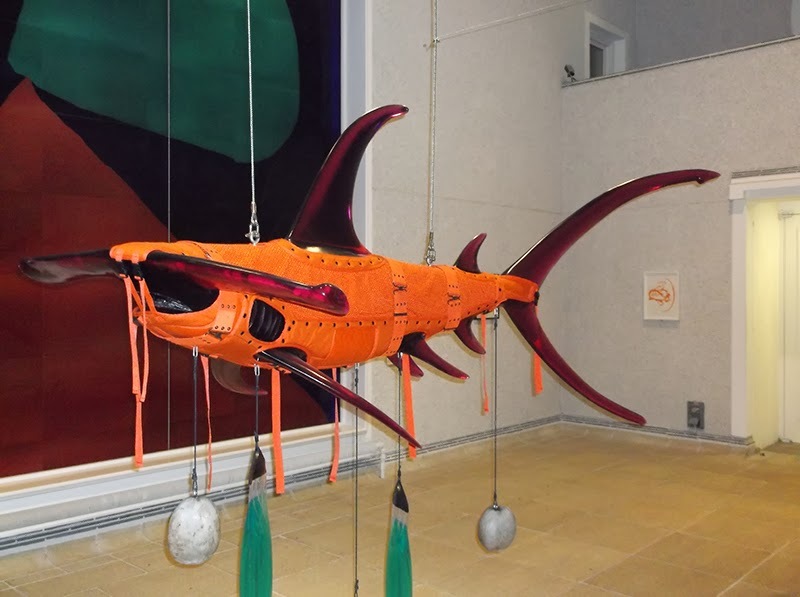 Tate St Ives has an exhibition - Aquatopia - The Imaginary Of The Ocean Deep. Open daily - 10.00 am to 4.00 pm. 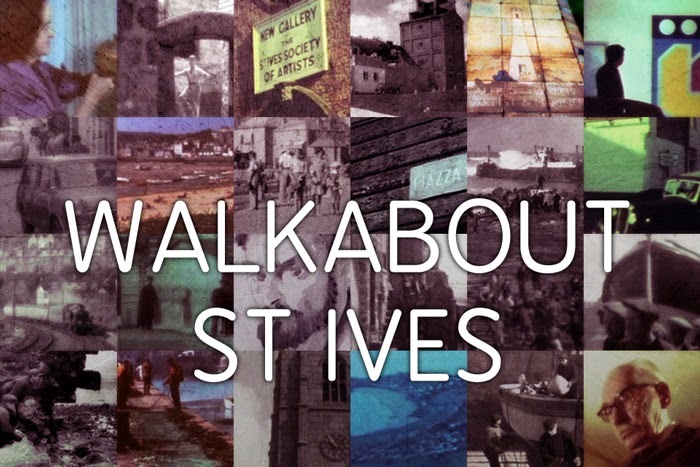 Also a special tour of the exhibition - with St Ives art historian Janet Axten - on Thursday (7th) at 3,30 pm. 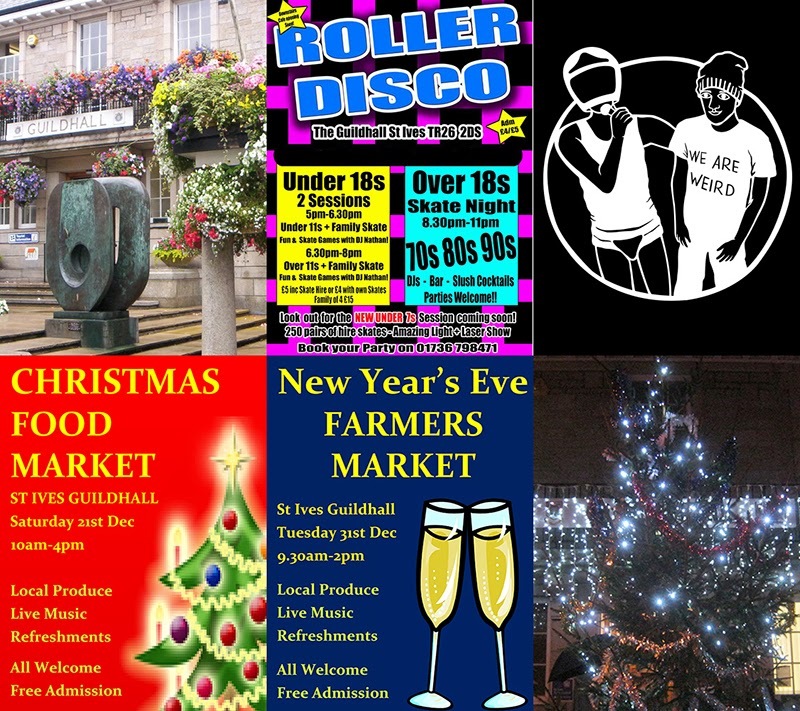 I've also added a new - experimental - page to my website - a poster board for local events - a sort of online version of the noticeboard at The Guildhall. If you'd like your poster on the board - visit the page and email your event. 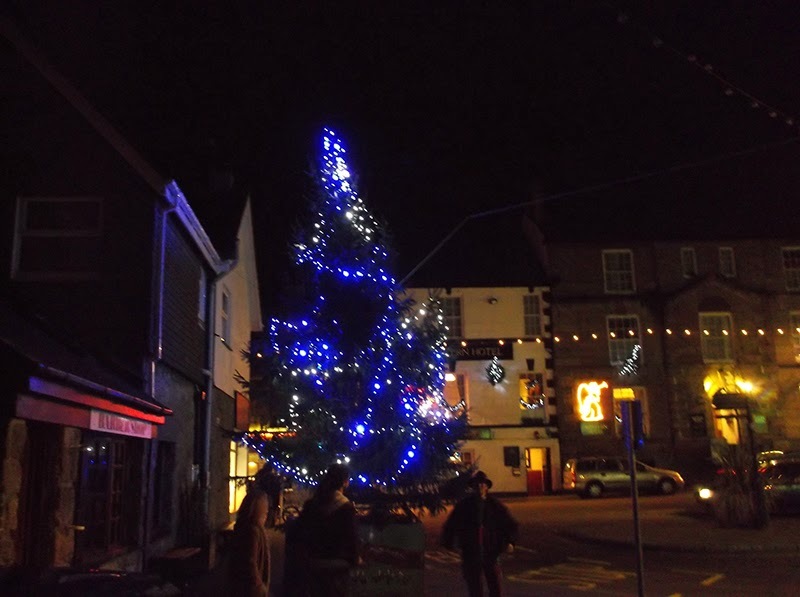 Finally - a new page for St Ives In December - Christmas - New Year. What (I think) is the most comprehensive What's On guide for the festive season. Again - email if you want your event featured. 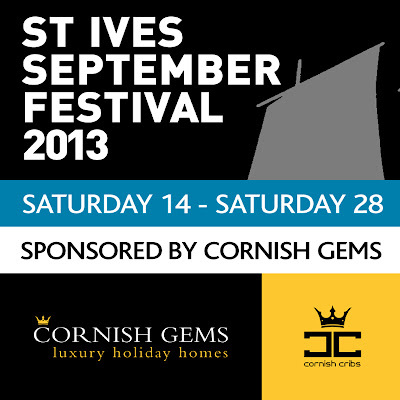 Have a great week in St Ives - more news coming soon. 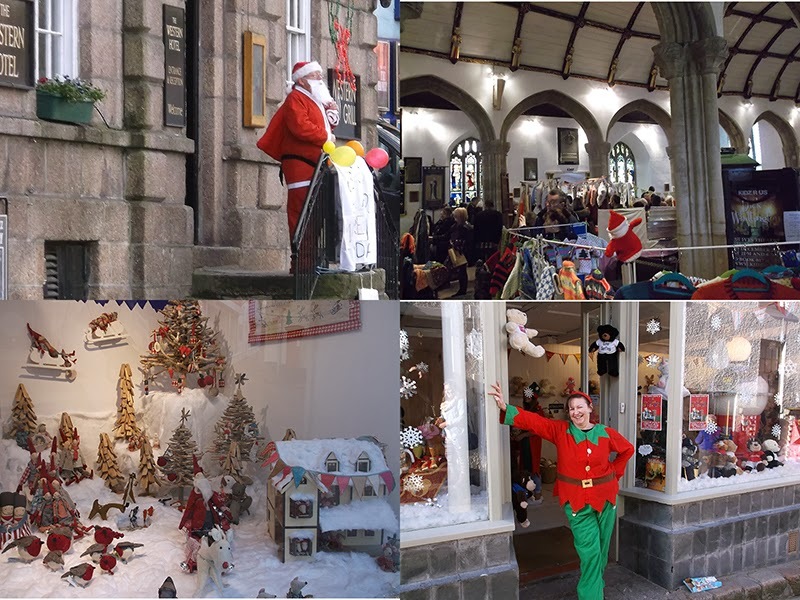 A varied mix of entertainment and shopping at St Ives Guildhall in November. With the half term holidays upon us (already!) - many kids (and parents) will be looking for exciting and interesting things to do. Sunday (27th October) - Skateboard and Scooter Competition. St Ives Skate Park - Penbeagle. Monday (28th) - Story Time and Crafts. Tuesday (29th) - Family Art Workshop. St Ives School Of Painting. Wednesday (30th) - Art Base. 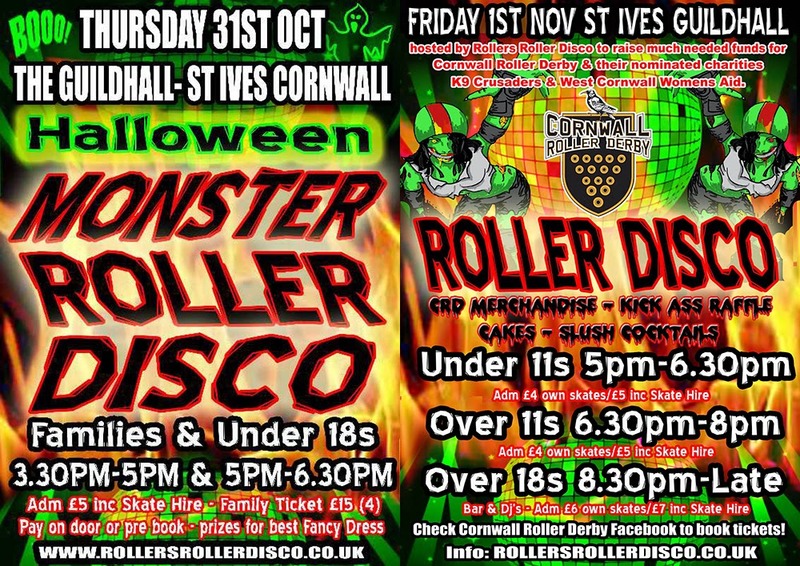 Thursday (31st) - Monster Halloween Roller Disco. Friday (1st November) - Craft Workshop - Make Pom Poms. A perfect way to end to your day - The Mex Restaurant St Ives has a special offer for kids. Open daily from 5.30 pm. A diary of my growing efforts on my plot - out below the Penwith Hills to the west of St Ives. A beautiful location - and my blog has some lovely photos to enjoy. 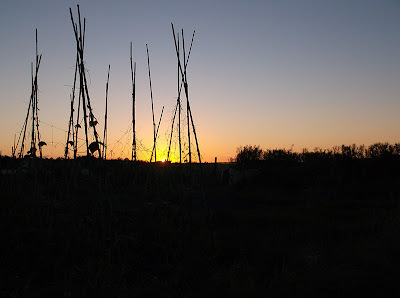 Plus what I hope are some interesting posts about growing through the seasons in Cornwall. Take a look - any feedback is welcome. 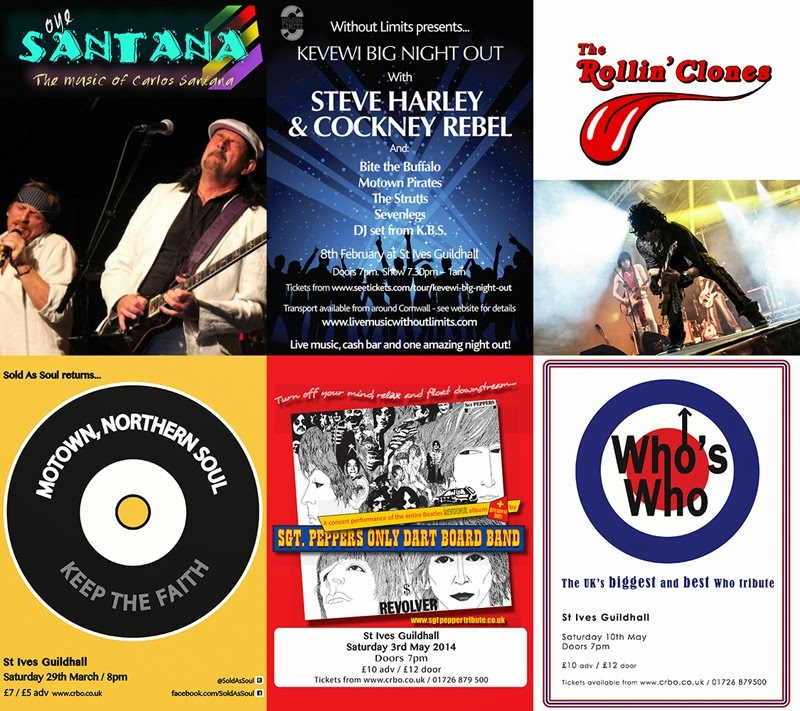 A new addition to the line-up at St Ives Guildhall that has already generated a lot of interest - and nostalgia. Mr Peggotty's Disco Revival - Friday 20th September. Featuring some of the original DJs from this iconic St Ives club. 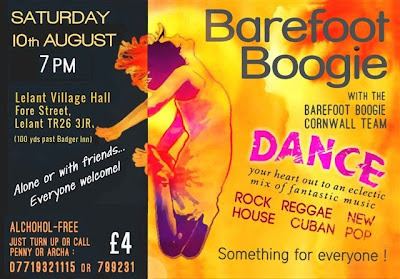 Tickets are just £5.00 - on sale now from Oates Travel - or call 01736 795 857. 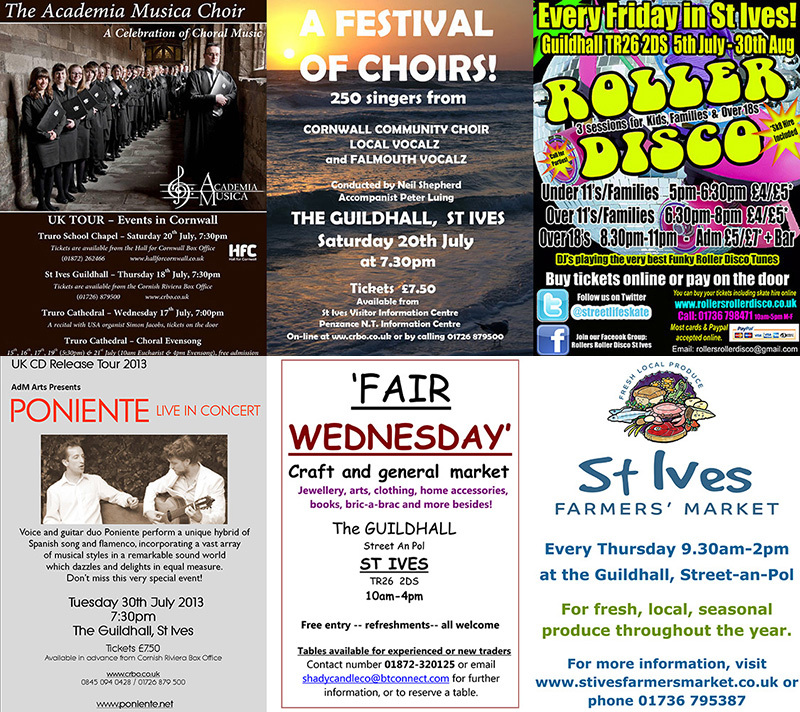 St Ives Guildhall has a full programme of events through August including theatre, stand up comedy, concerts, roller discos and three weekly markets. Tuesday 6th August - 3.00 pm - The Sea Show. Tuesday 13th August - 3.00 pm - Skillywidden. Tuesday 20th August - 3.00 pm - Curious Creatures. Family Skate - Thursdays - 6.00 pm and 7.30 pm. Family Skate - Fridays - 5.00 pm. Over 11s Teen Skate - Fridays - 6.30 pm. Over 18s Roller Disco Party - Fridays - 8.30 pm. Saturday 24th August - The Music of John Denver. Sunday 25th August - Stand Up Comedy - Kernow King. Monday 26th August - The Secret Policeman's Ball. St Ives Jumbo Association are holding another Scully Day on St Ives Harbour on Sunday 4th August - starting at 2.00 pm on the Old Slipway. These are free events for the family which were introduced two years ago to encourage as many people as possible to 'scully' - the traditional method of propelling a small boat using a single oar over the stern. 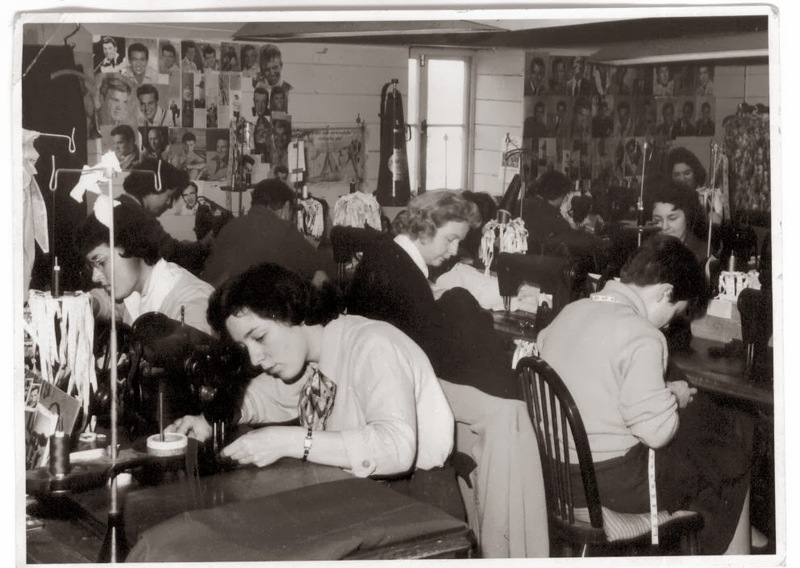 An opportunity of acquiring a new skill which, only recently, was a 'rite of passage' for any St.Ives boy yet is now at risk of being forgotten. In St Ives, at least, the art of scullying is being revived. 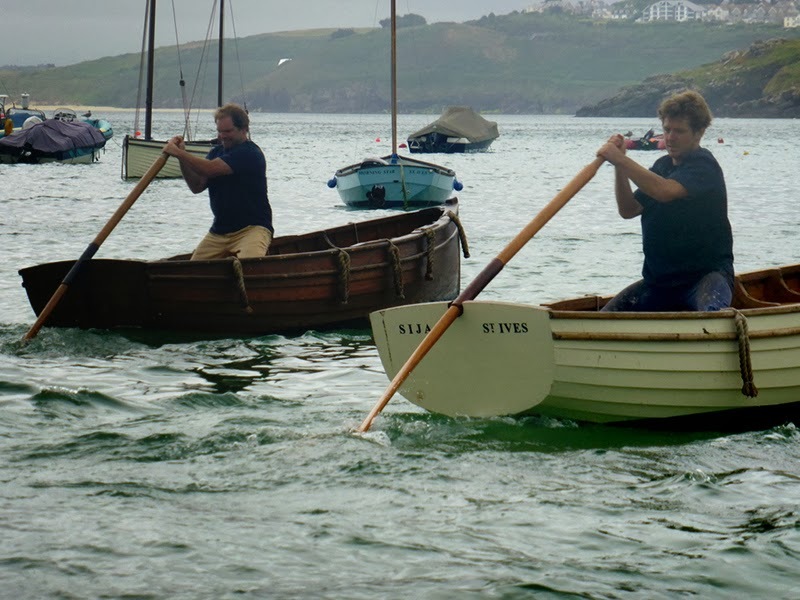 Also on the harbour will be St Ives Pilot Gig Club - newcomers to gig racing will be offered a chance to try their hand at rowing the gig 'Defiance'. Scully Races will then begin at 4.30 pm. It has been proposed that St Ives Boatmen should take on the Rest of the World! 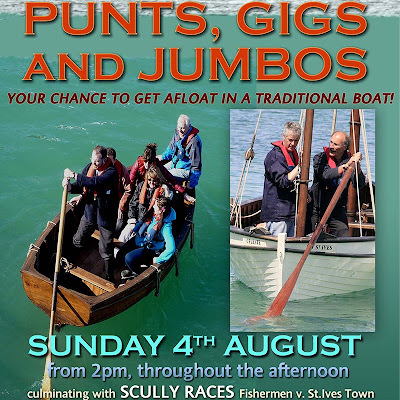 Contestants are eagerly sought to help bring scully racing back to St.Ives. The summer holidays are here - and so I thought I'd highlight some fun and creative activities for children in St Ives. 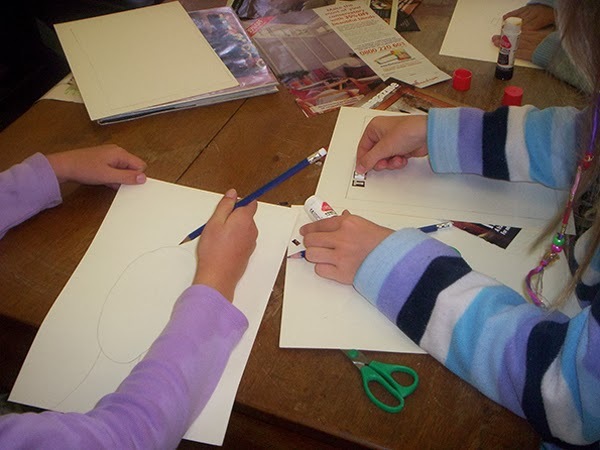 St Ives Library - kids creative workshops with Jo McIntosh. Thursday 1st August at 2.00 pm - Sea Treasures. Monday 5th August at 2.00 pm - Making Books. Monday 19th August at 2.00 pm - Felt Brooches. Each costs £3.00 per child. Advance booking is advised - visit the library or call 0300 123 4111. 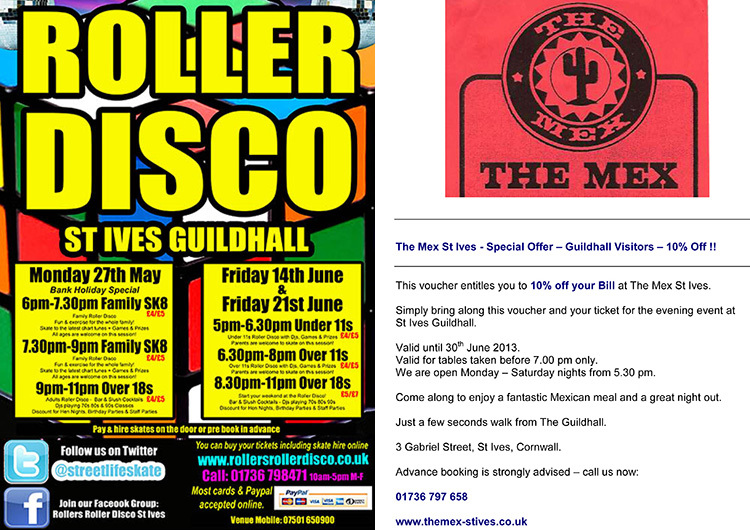 St Ives Guildhall - Rollers Roller Disco - Family Skate every Thursday at 6.00 pm and 7.30 pm, every Friday at 5.00 pm. Teen Skate - every Friday at 6.30 pm. Tickets are £5.00 - on the door or you can book via the website. 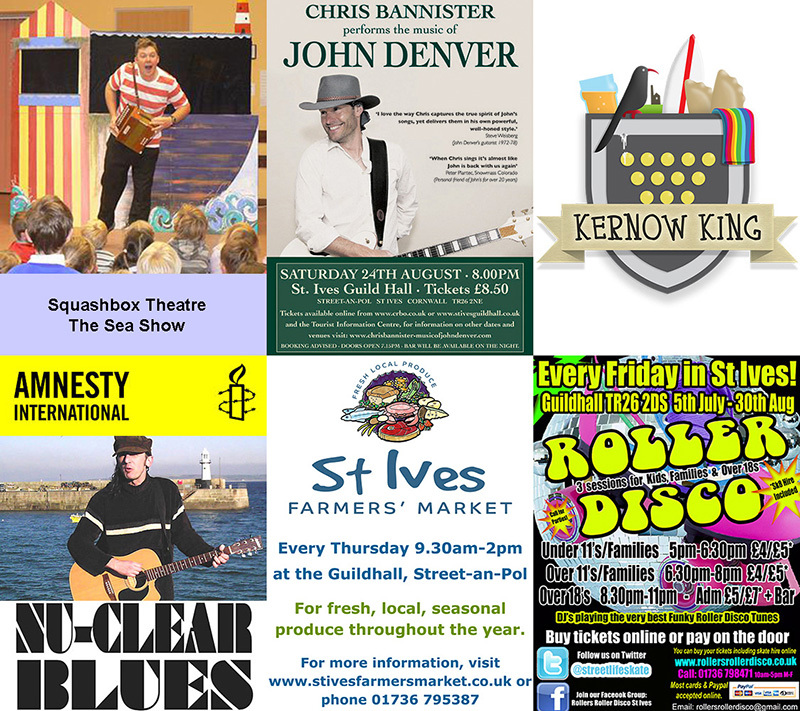 St Ives Guildhall - Squashbox Theatre are staging weekly shows for children. Tuesday 6th August - The Sea Show. Tuesday 13th August - Skillywidden. Tuesday 20th August - Curious Creatures. 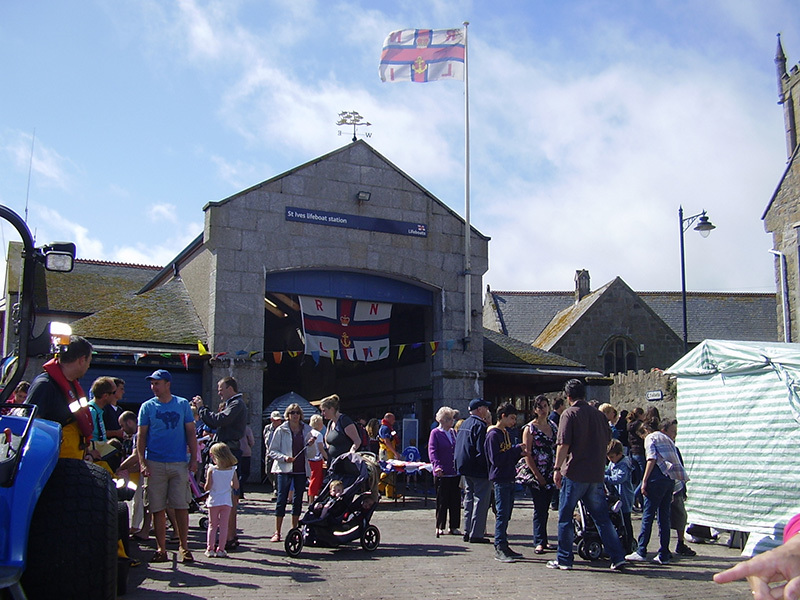 All shows start at 3.00 pm and tickets are £5.00 - available from St Ives Visitor Information Centre or you can book via the website. As usual - lots to see and do in St Ives this weekend - including art exhibitions, music and theatre. Friday - Lunchtime Concert - Laura Nicholas. St Ives Parish Church - starts at 12.30 pm. Friday - Rollers Roller Disco. 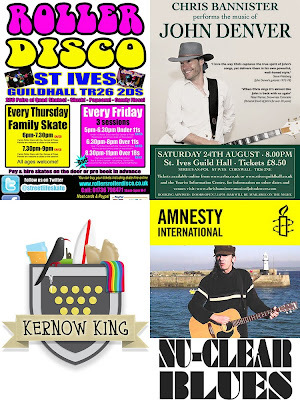 St Ives Guildhall - three sessions for all ages from 5.00 pm. 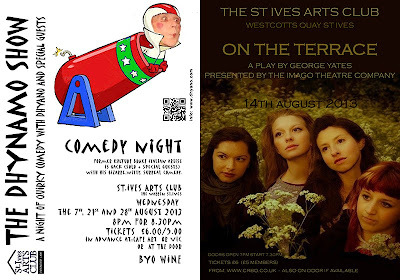 The Mex St Ives have a Special Offer - 10% Off for ticket holders. Saturday and Sunday - The Taming Of The Shrew - Kings Shakespeare Company. 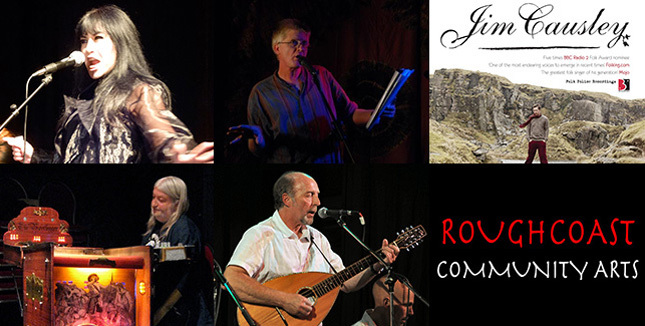 St Ives Guildhall.- doors open at 7.00 pm - performance at 7.30 pm. Sunday - Music and Performance Evening - The St Ives Busker. St Ives Arts Club - starts at 7.30 pm. 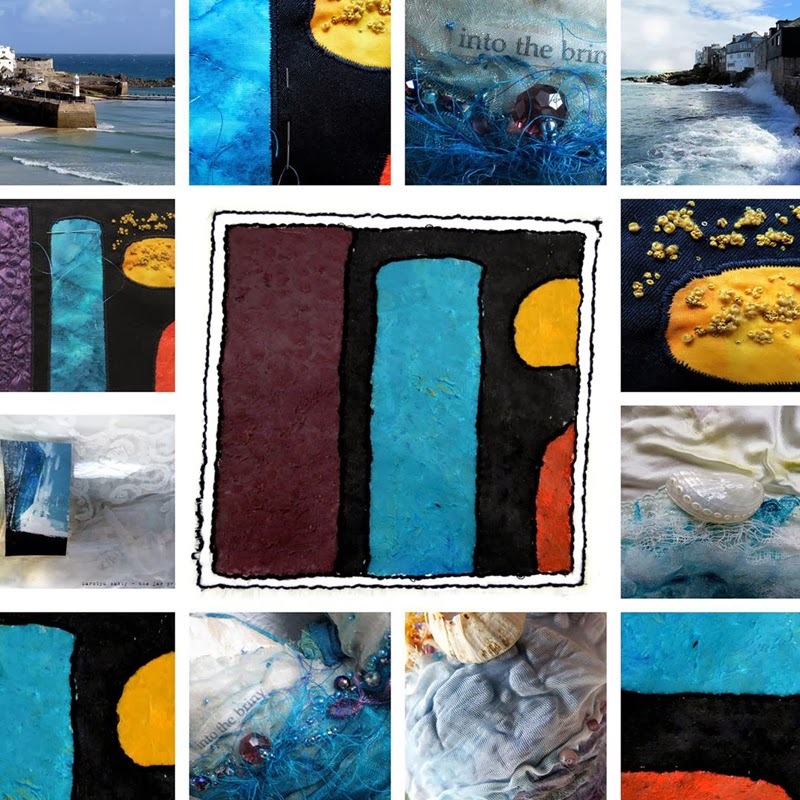 Exhibitions include Bob Wilcox at Cafe Art, Ultramarine Studio at St Ives Arts Club and Members Summer Show at St Ives Society Of Artists.